Are you looking forward to incorporate the flow of freshness to your website? Well, for this, you must spend some considerable amount of time in order to optimize your website efficiently. Here’s the list of some significant SEO techniques that can help you polish your website effectively. The key is to inculcate the fresh and stylized content. Update your blog with high quality content and come up with trending topics on a regular basis. This will certainly help you promote your brand, thus providing you with an increased number of viewers. Get engaged with your target customers through social media platforms. Be it Facebook, Twitter, Pinterest, or Instagram, these platforms will help you in acquiring top search results. Do you know the importance of keywords in the content? Well, keywords are the way to top search results. However, it doesn’t mean that you will focus only on keywords. No! This is not the right way to do! That being said, you must create a relevant and engaging content while focusing on the keywords simultaneously. 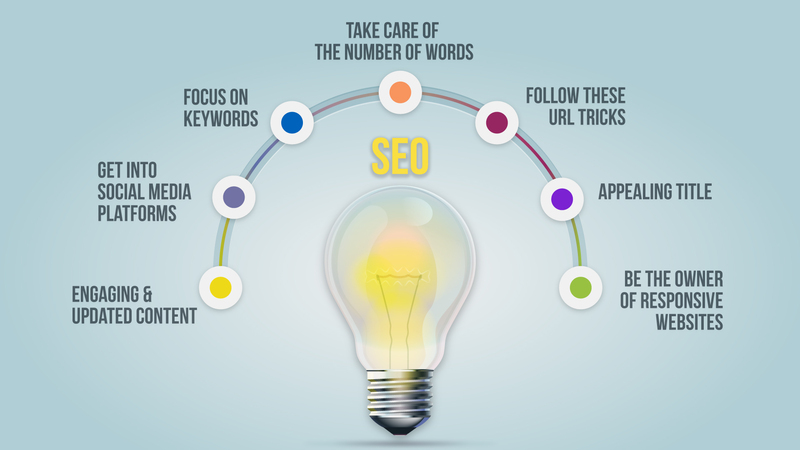 Apart from focusing on the keywords, the counts of your words will help you draw the attention of search engine. Yes! The more long the article, more are the chances for it to get identified on search engine. So, say no to short articles and try to include content that goes with the standard count of words. Following these small URL tricks can help you optimize URLs in an efficient way. Firstly, make use of dashes and hyphens to separate the words. Make sure not to exceed the limit over 100 characters. In order to acquire local ranking, you need to focus on location based keywords. An appealing blog title plays a major role in SEO ranking. Yes! An enticing title can influence the reader to read the particular blog. Moreover, incorporating the keywords strategically in the title will be an icing on the cake! Do you want to stay connected with your viewers? Well, you cannot do so if you are not having a responsive website. Yes! As people nowadays prefer to meet their needs on the go, a non-responsive website will leave you far behind from your competitors. All in all, being SEO friendly is not as easy as it seems to be. You need to follow the latest algorithms in order to be at the top. The digital marketing services provided by Mamsys strive to keep your website at the top always.